Many symbols and customs surround Chinese Lunar New Year celebrations. And living in China since 2005 has given me some insight into each symbol or custom which has its own deep meaning and importance. By learning about these customs and traditions, you too can bring prosperity and happiness into your lives. The Western calendar follows the sun cycles whereas the Chinese Lunar Calendar is based on the cycles of the moon. This Chinese New Year symbol often shows the dates of both the Western calendar and the Chinese Lunar Calendar. The Western dates are printed in Arabic numerals, and the Chinese dates are communicated in Chinese numerals. The 12 animals of the Chinese Zodiac have a specific order according to a folk tale and the animal signs are repeated every twelve years. 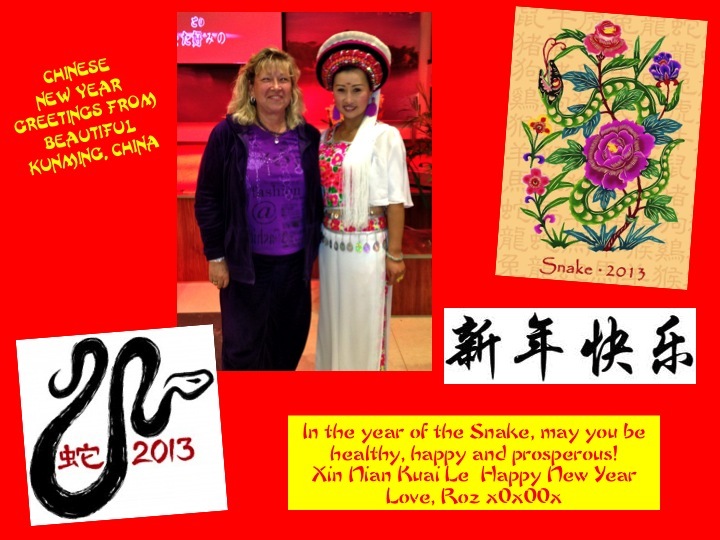 2013 is the year of the Snake and 2014 will be the year of the Horse. The fifth time that an animal is repeated in a person’s life is their Golden year. So when a person reaches their 60th year, their sign is golden. Flowers are very prevalent in all Chinese New Year decorations. The plum blossom and the water narcissus are the two flowers most associated with the New Year. Plum Blossoms: The plum blossom stands for courage and hope because the blossoms appear at the end of winter when it’s still quite cold on plants that look for the most part dead. When shown in art in general, plum blossoms are associated with the entire season of winter. Water Narcissus: The water narcissus signifies good luck and fortune. It’s a flower that blossoms usually at New Year’s time. If the white flowers blossom on the New Year Day, this means that one would have good fortune for the next twelve months. Children and young adults receive hong bao at Chinese New Year’s time. The envelopes contain money or gold covered chocolate coins. The money must be in new bills, and the total amount must be an even number. Certain numbers (such as four) are bad luck, so the total amount should not be one of these unlucky numbers. “Four” is a homonym for “death”, so a red envelope should never contain $4, $40, or $400. While mainly given to children, some employees of high company standing will receive a large hong bao bonus and regular employees will receive an extra month’s salary in the red envelope. Since it is common to believe that evil spirits are driven away by loud noise, the setting of loud firecrackers is prevalent throughout the 14-day holiday celebration. Long strings of firecrackers are set off as fireworks light up the evening and morning skies . Taiwan and Mainland China still allow almost unrestricted use of firecrackers and other fireworks. The single word “FU”, or fortune, is often displayed in many homes and stores, supposed to be a lucky Chinese New Year symbol. They are usually written by brush on a diamond-shaped piece of red paper. When placed upside down, the meaning changes to ‘Bringing in the good fortune’. Spring couplets are a very old symbol and holding traditional significance, usually written with black ink on red paper. They are hung in storefronts and on household doorways in the month before the Chinese New Year’s Day, and often stay up for many months afterwards. They all express best wishes and fortune for the coming year. Tangerines for good luck and oranges for wealth are frequently displayed in homes and stores. Chinese like playing with words and symbols. Often homonyms (words that share the same pronunciation but have different meanings) are used. The word tangerine has the same sound as “luck” in Chinese, and the word for orange has the same sound as “wealth”. Most families keep a tray full of dried fruits, sweets, and candies to welcome guests and relatives who come for visits. This tray is a “tray of togetherness”. This Chinese New Year symbol was traditionally made up of eight compartments, each with a specific significance. The Chinese cling to the cultural traditions of this holiday to make this one of their most special yearly celebrations.